Hello COMC Nation! 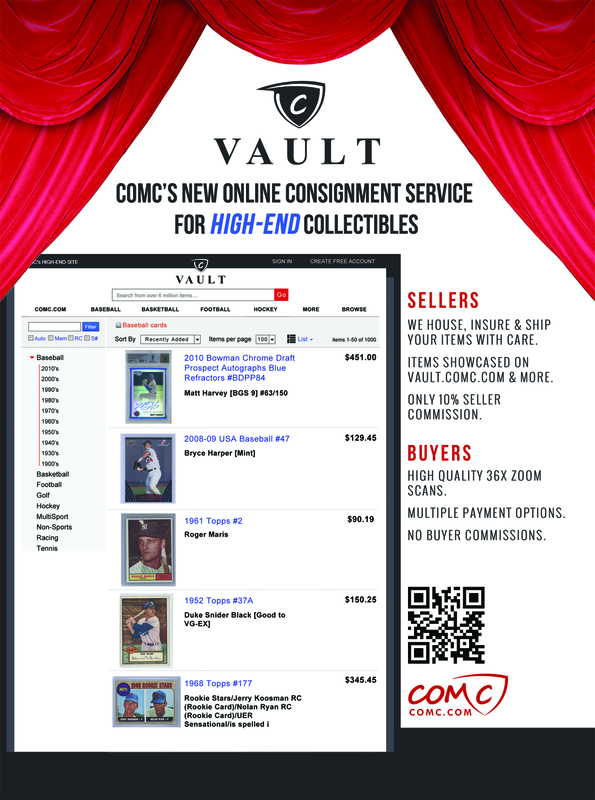 There’s just over a week to go before the official launch of the Vault, as well as the start of The National, and COMC is kicking things into high gear. With the building excitement over our new service, we felt that just one announcement in the upcoming issues of Beckett wouldn’t be enough. We look forward to hearing your thoughts on this advertisement and are eagerly awaiting the chance to see as many of you as we can while we are at the National. As a reminder, be sure to have your Vault Eligible items listed for sale by the 24th in order to have them taken to the show! And as always, keep up with us on our Facebook, Twitter, and Google+ pages. This entry was posted in Advertisement, new features, The Vault. Bookmark the permalink. This is a game changer, I can’t wait to see this roll out!